I just read about a million people have signed a petition to call upon the electoral college to vote for Hillary. Where did we see this before? Oh ya. The days leading to Trump being nominated. Do not become discouraged. No matter what you hear on the news, Donald Trump will be sworn in as the 45th president on Jan 20. Trump won't get any support. Trump won't win a state. Trump won't get anymore states after New Hampshire. Trump won't be the front runner for long. Trump will lose to Cruz after Wisconsin. Trump won't get to 1,237 delegates. Trump will lose in a contested convention. Trump won't be the Republican nominee. Trump can't beat Hillary Clinton. Trump won't win the election. Trump won't get Mexico to pay for the wall. Trump won't Make America Great Again. Tradition says we refer to Trump as president elect now. Technically he is not until after Congress validates the electoral college. 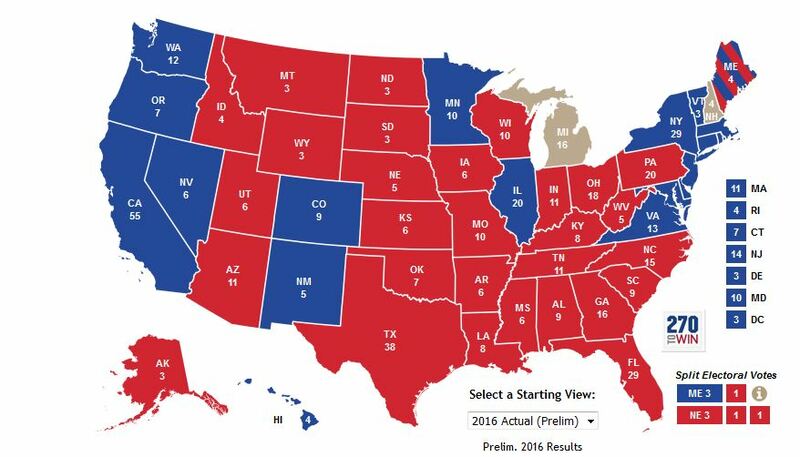 I want to start with a discussion on a theory I have based on the election results and the geographic regions of our country. Stick with me, even if I don't make sense. 6. The red states are mostly people who farm and own a lot of land and not only that, but we are mostly not URBANIZED like cities of NYC, Boston, LA, etc. My point I'm trying to get at is that if you go look at the rest of the world, they pack people into spaces like sardines. In America, we have the right to own actual LAND and claim our own spaces. I truly think that a lot of people's mindsets have been created over many decades due to sharing their space with other people. Sharing is caring, but us as humans need to have our space...we as a species are created to be individuals, to be independent free-thinkers. Socialism and globalism are not that paths our United States need to take. Our country was created by people who fled a ruling class-society...so why do we have people that want to go back to those days??? Anyone else find it hypocritical how the so-called Democracts, the ones protesting by calling the results unjust and demanding a re-do, are basically going against what makes a democracy? You won't change the results with a temper tantrum; the people have spoken, Trump won, that's all there is to it. the protest itself isn't anti democracy but the rhetoric that we should just void the election is insanely stupid and anti democracy. This is why it's more apt to call them democrats rather than liberals, because this particular brand of hypocrisy isn't what liberalism is about. The criticisms against the electoral college are, in my opinion, at least somewhat justified even if I don't necessarilly agree. Ironically even Trump thought negatively of the electoral college before it cemented his victory. Though let's be honest here, the vast majority of these protestors aren't angry at the electoral college. They're angry that "racist Trump" won. Even if he had popular vote I bet there would still be protestors in the streets. Though let's be honest here, the vast majority of these protestors aren't angry at the electoral college. They're angry that "racist Trump" won. How is this not racists? Also, I have to link to liveleak because Google is still censoring opinions on YouTube, even after Hillary loss. Google will always try to control your opinion and never will stop. If white people attacked a black Obama supporter, there would be racists allegations everywhere. It goes both ways. These are racists. Plain and simple. The electoral college makes sense in a young democracy, I think now it's unnecessary at best. id have less beef with it if it wasn't simply winner take all. Electoral college is absolutely necessary. And if anyone wants a summary of the last year, here you go. You're welcome. The 45th President-elect of the United States of America! Reports are coming out saying that Hillary was crying her eyes out and blaming Obama and Comey for her loss. I really, really wish there was a camera in there. The "tolerant" left are out in full force in Portland, Oregon tonight. Rioting and vandalizing their own city. It must be embarrassing to be a Democrat. Electoral college makes logical sense. Each state should have a say in the election, not just heavily populated states like California that are full of mindless, mob mentality, zombies. It only makes sense when you see the union of states as a union of states and not a union of the people. The state was suppose to be the dominate government, not the federal government. Things got flipped with FDR where the federal government began to dominate the states. The entire concept of getting the people to vote for the senate was to eliminate state power in the federal government. 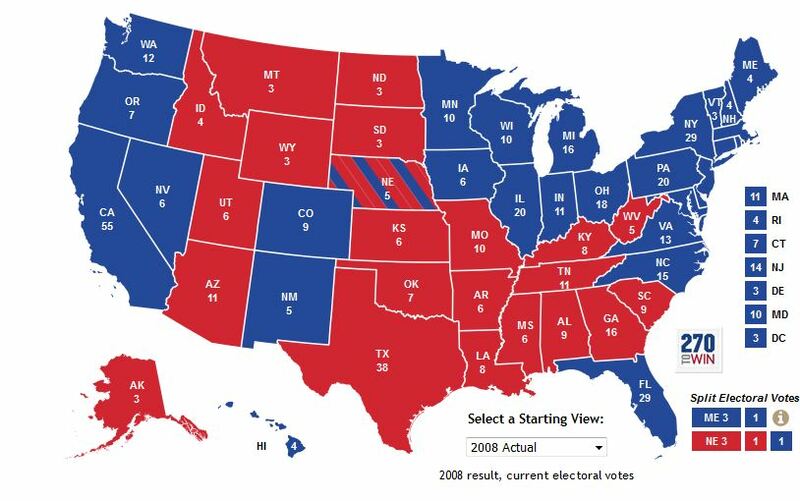 The concept of eliminating the electoral college is to further erode states as a relevant force in American politics. The man FOX is announcing on the short list for Secretary of Homeland Security. Each day is like Christmas now. Sheriff Clark on the short list for Secretary of Home Land Security. You all must see the freaking huge benefit! That guy is American through and through. Also, the electoral college dramatically lowers the risk of voter fraud effecting an election. Let's say 300,000 of Hillary's 55,000,000 votes were fraudulent or simply miscounted across the board? Well, that might have cost Trump a state or two in the electoral college, but it would have cost him the election if it were based on popular vote. it is racist. it goes both ways. any person with a head on their shoulders knows this. people with a head on their shoulders, regardless of political party, know this is wrong, continuing to be hung up on "can you imagine if" is pointless and serves no purpose but to create a divide. especially when you only focus on wrong doing committed against people with your same views. this isn't a partisan issue, stop making it out to be. you should be vocal when wrong is wrong, and calling for unity without being able to do that is an empty, meaningless proposition. that video is plainly disturbing, and I don't have an urge to look for any reason he might have deserved it because his views don't align with mine. people are poor at articulating this, but it's important. stop marginalizing the meaning or motive of hate or crimes because it effects people who don't agree with your political views. it happens over and over again because people don't like the harsh reactions to things, but if people were vocal about standing up for what's right, it wouldn't drive people to protest in the streets. this is such bad taste. have some class, your candidate won. it's not in the spirit of any part of our countries values to want to humiliate your opponent to tears and take pleasure in it. also, do you even believe this? a woman as collected and calculated as hillary clinton just lashed out to tears with a bunch of people around? a picture was posted of her walking her dog today and she looked fine. The voter fraud protection is a legitimate perk of the electoral college but the "tyranny protection" is bunk. Candidates still mainly campaign in heavy population centers and swing states, and major policies/laws are already crafted around what will get a candidate re-elected, which is (to the candidate's best knowledge) what the majority wants. Most people live in metropolitan centers, and the demographics of many areas in the country are also mostly set in stone - there is absolutely no point in a Democrat campaigning in Alabama right now. Point being, it's six one, half dozen another. Do you think anyone in this thread thinks this is okay? Seeing as how horrible of a person Hillary is, mixed with the riots that her supporters have began I have no reason to have any of your class. Liberals are the biggest group of whiny entitlement junkies who were not spanked enough or ever told "no" as a child. The liberal fascism has made me sick. America isn't a democracy its a representative republic and there is no constitutional right to vote in presidential elections. one of the worst ironies about this election is that the party that cried "voter fraud" won the election with fewer votes due to an outdated and undemocratic system and successful voter suppression efforts in battle ground states.